Offshore energy production in the Gulf of Mexico has experienced relatively minor disruptions because of tropical storms and hurricanes in recent years, and the National Oceanic and Atmospheric Administration (NOAA) has predicted a below-normal 2015 hurricane season in its updated Atlantic Hurricane Season Outlook, released on August 6. 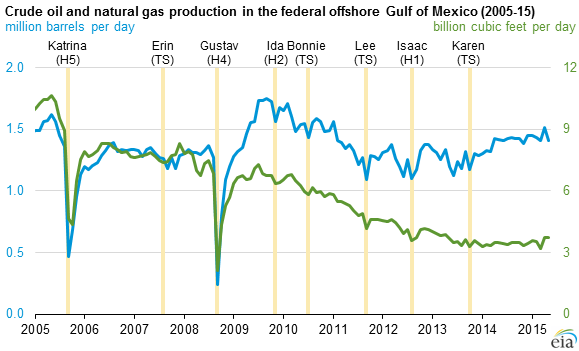 Hurricane-related risk to total U.S. crude oil and natural gas production has decreased over recent years as the share of total U.S. production originating in the Gulf of Mexico has declined sharply. In 2003, 27% of the nation's crude oil was produced in the Gulf of Mexico; by 2014, that share had declined to 16%. 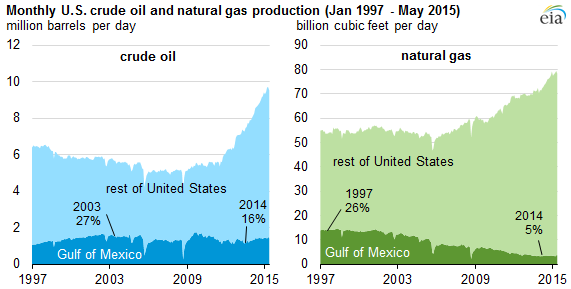 The Gulf of Mexico's share of natural gas production has also declined from a high of 26% in 1997 to 5% in 2014. This decline in the Gulf of Mexico's share of production has reduced the vulnerability of U.S. crude oil and natural gas supply to hurricanes. Based on NOAA's outlook, EIA estimated in its June Short-Term Energy Outlook that storm-related disruptions in the Gulf of Mexico during the 2015 hurricane season would total 9.7 million barrels of crude oil and 15.9 billion cubic feet of natural gas, or 3.5% and 2.8% of total Gulf of Mexico oil and natural gas production, respectively, and even smaller percentages of total U.S. production. No crude oil or natural gas production in the Gulf of Mexico was shut in during the 2014 hurricane season, and EIA estimated a 14% probability that production during the current hurricane season will also be unaffected. Note: TS = tropical storm, H# = category # hurricane. Strong storms are still capable of causing significant production outages. Hurricane Katrina, which made landfall on the U.S. Gulf Coast 10 years ago Saturday, and Hurricane Rita, striking less than a month after Katrina, shut down almost all offshore natural gas and crude oil production for several days, with production remaining at reduced levels for months after the hurricanes. In September 2008, Hurricanes Gustav and Ike shut down almost all production in the Gulf of Mexico. Even if the offshore rigs are not directly in the projected path of the hurricane, these rigs may be evacuated as a precautionary measure. The Gulf Coast is also home to about half of U.S. refining capacity, and several natural gas processing and distribution facilities that could also be affected by severe weather. However, high levels of crude oil inventories, both domestically and globally, could mitigate the supply impacts of weather-related disruptions. Similarly, natural gas processing capacity has been added in areas beyond the Gulf Coast in recent years, lessening the potential effect of storm-related processing outages. Energy infrastructure in other areas of the eastern United States is also susceptible to hurricane-related disruptions. Hurricanes Irene (2011) and Sandy (2012) caused extensive damage to power transmission and distribution lines in the Mid-Atlantic and Northeast states. In addition to direct impacts to millions of electricity customers, the damage to the power infrastructure temporarily shut down some petroleum refining capacity, natural gas processing, and distribution terminals. To help analysts assess potential storm impacts along the Gulf Coast, EIA maintains an energy disruptions page and a Gulf of Mexico fact sheet. The map contains information on energy infrastructure and real-time storm information. The fact sheet combines this map with more detailed data on crude oil and natural gas production in the region.